Health care investor Nate Sadeghi says Pfizer is holding back bad news on its Alzheimer's drug, tells Human Genome to sell to Glaxo and likes Vertex and Gilead Sciences. NEW YORK ( TheStreet) -- I've been a professional investor for 15 years, and over that time I've listened to generalist investors gripe about the health care sector with mind-numbing cyclicality. Predictably, interest in health care investing often hits a nadir at the time of greatest opportunity. The complaints, which typically arise after major biotech blowups or government policy-fueled anxiety, range from absurdly broad-based assertions of disinterest (health care is "un-investable" is a common refrain) to specific anxiety about the sector's dependence on government as a payor. Investors who dismiss the health care stocks often do so because they lack the expertise required to understand the sector. They're missing a lot. For those who think -- or have ever thought -- health care isn't a great sector for alpha generation, I present the first half of May in the year 2012, one of the busiest and most exciting two weeks for health care in recent memory. This week's column reviews -- in the first of two parts -- key events and the implications for relevant companies. On Pfizer's ( PFE - Get Report) Q2'12 call, management revealed that the first of four massive Phase III trials of bapineuzumab -- the infamous amyloid beta-targeted monoclonal antibody initially developed by Elan ( ELN for Alzheimer's disease -- has been completed. This study, led by syndicate partner Johnson & Johnson ( JNJ, enrolled 1,121 mild-to-moderate Alzheimer's patients with an unfavorable genetic mutation, called ApoE4, to receive either "bapi" or placebo. Importantly, Pfizer said it plans to wait until the third quarter to disclose top line results from this trial alongside those from a second Phase III trial, which includes patients without the ApoE4 mutation. The non-carrier trial should be completed in August. As a reminder, the whole ApoE4 carrier versus non-carrier split was born from the post-hoc data mining of Elan's flagrantly equivocal Phase II trial. Bulls insist the non-carrier study is more likely to succeed, because ApoE4 carriers with Alzheimer's are "too far gone" despite having clinically identical mild-to-moderate disease as the non-carriers. I still don't get why carriers, who have a worse prognosis, wouldn't respond better to a drug targeting amyloid beta, the alleged bad actor. Faulty logic. Let me be crystal clear: if the Elan-Pfizer-Johnson & Johnson triumvirate had positive Phase III data in Alzheimer's disease, executives would be grabbing megaphones and singing "Hallelujah" from the rooftops. In midtown last week near Pfizer headquarters, all I heard was car horns and ordinary conversation, so my guess is the data aren't good. In lieu of megaphones, company scientists are likely reaching for statistical pickaxes. Let the data mining begin! The world might have to wait until the third quarter for the official announcement, but I'm pretty sure I know the answer to the bapi question now. Remember when Vertex Pharmaceuticals ( VRTX - Get Report) had a hepatitis C franchise? Neither do I. Last week, Vertex unveiled interim data from a trial of the company's marketed cystic fibrosis (CF) drug Kalydeco in combination with the experimental VX-809, a "corrector" of the dysfunctional cystic fibrosis transmembrane conductance regulator (CFTR) protein. The study focused on individuals with a particular genetic mutation known as F508del; nearly half of the roughly 70,000 CF patients globally are homozygous F508del mutation carriers, meaning these individuals have two copies of the bad gene. Despite having data from only a small cohort, the combined Kalydeco and VX-809 dose groups unexpectedly showed a statistically significant improvement in FEV1, a well-accepted measure of lung function, compared to placebo. Vertex bears initially focused on the fact that the company didn’t reveal the mean FEV1 change. Although I think the "back calculated" 3-5% mean FEV1 improvement estimated by several Wall Street analysts seems reasonable, investors should focus instead on the 46% and 30% of treated patients that had an FEV1 gain of greater than 5% and 10%, respectively. No placebo recipient had even a greater 5% improvement in FEV1. I'm usually a skeptic, but that's extremely clinically relevant. I can’t quite explain the lack of a significant benefit in sweat chloride -- a surrogate marker of disease that drove initial excitement about the Kalydeco-VX-809 combination in earlier studies -- but Vertex noted that trends favored drug recipients. Given the FEV1 differences observed, that's good enough for me. I am curious about the durability of the FEV1 improvements, but those questions will likely remain unanswered until Vertex completes Phase III trials, which should start later this year. Vertex's hepatitis C franchise remains on life support so the company desperately needs to expand the addressable CF opportunity to reignite investor excitement. 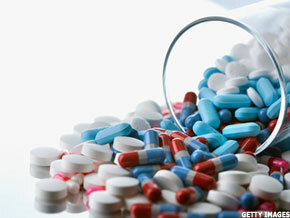 (Kalydeco currently has FDA approval only for a small subset of patients.) These combination data make that goal very achievable. Some Wall Street analysts expect Vertex to slash the cost of therapy for the combination -- Kalydeco alone currently costs $250,000-300,000 per year -- in recognition of this new, larger patient population. I doubt it. I've never believed the industry's patients-over-profit rhetoric. To be conservative, let's assume Vertex is feeling generous and use a combination price of $200,000 per year as a floor. That suggests a global market opportunity of $7 billion. I'm a bit of a cheapskate when it comes to investing, but I think there could be upside to Vertex even from here. Nonetheless, the stock could sell off a bit over the next few months due to a combination of profit taking and reluctance to chase a nearly 70% move in one week. I would buy a little here -- Vertex' attractiveness as an M&A candidate just improved dramatically -- but wait until a dip into the mid-$50s per share to become more aggressive. In mid-April, GlaxoSmithKine ( GSK offered to buy partner Human Genome Sciences ( HGSI for $13 per share, 81% higher than the company's stock price at the time. Rather than blissfully accept salvation from the biotech doldrums, Human Genome demurred, presumably in the hopes of getting a few more shillings. Dumb move. Last week, things got hostile and Glaxo went directly to shareholders with a tender offer. If I owned Human Genome shares, I would take the offer and mail Glaxo CEO Andrew Witty a thank you card. Don't forget the "Sir" -- he's got one of those fancy British appellations. Too often, biotech executives want to "build the next Gilead" -- read venture capitalist Bruce Booth's excellent recent blog post on this topic -- at the expense of shareholder value maximization. This seems like one of those cases. Human Genome's lupus drug Benlysta -- to which it owns 50% rights -- has been struggling commercially since launch. Although sales will likely grow, I think it will be a slog, and competitors -- notably Anthera Pharmaceuticals -- will have data for similar lupus drugs around mid-year. Finally, it's hard to know what to make of darapladib, Human Genome and Glaxo's Lp-PLA2 inhibitor -- don’t ask; it's an unproven inflammation inhibitor -- for the treatment of chronic coronary disease. The drug could work in ongoing Phase III trials, but if it fails Human Genome shares will return to the doldrums and stay there. I don't feel like I have any edge on darapladib, so I'd rather just pay the $1.05 postage for my thank you letter and move on to more promising opportunities. Prophylaxis and Treatment: Together at Last? Gilead Sciences ( GILD - Get Report) had a busy week, receiving two favorable FDA advisory panel recommendations for its HIV medicines. As expected, the Quad -- a combination of Truvada, the integrase inhibitor elvitegravir, and the pharmacokinetic booster cobicistat -- received a 13-to-1 vote for approval in treatment-naive adults with HIV. Although not a surprise, Quad is a critical step in the company's HIV lifecycle management strategy and some investors had worried that the FDA's desire for a panel implied heretofore hidden issues with the data. That wasn't the case. The favorable vote, which included manageable recommendations for monitoring of kidney function -- a minor, safety worry -- is a good "check the box" milestone that should further ease investor anxiety about Gilead's prospects and lower the hurdle for multiple expansion. I expect Quad to receive final FDA approval by the late August approval decision date and to launch shortly thereafter. A more interesting recommendation came last Thursday, when the same FDA advisory panel voted solidly in favor of approving Gilead's Truvada for HIV prophylaxis in uninfected adults. No drug has yet received an FDA approval for this indication. I'm skeptical the FDA will actually approve this prevention regimen, called pre-exposure prophylaxis, or PrEP. (The FDA takes panel guidance into consideration, but is not obligated to follow its recommendations.) If the FDA does approve PrEP, I suspect there will be lots of restrictions to ensure appropriate usage. My primary concern is with non-adherence. Would-be PrEP recipients are otherwise healthy individuals, and inconsistent use of Truvada could reduce efficacy and increase the risk of disease resistance. Antiretroviral prophylaxis also has implications for other effective STD prevention strategies, like condom use. Either way, the favorable PrEP advisory panel vote reconfirms an important data point for investors: HIV experts are so comfortable with Truvada's efficacy, safety, and resistance profile that these physicians are willing to recommend the drug for use in healthy individuals. I couldn't imagine a clearer signal that Truvada will remain the "gold standard" backbone of HIV therapy for the foreseeable future. It's not dirt cheap, but I still think Gilead is worth buying at prices below $50 per share. Nathan Sadeghi-Nejad has 15 years experience as a professional health-care investor, most recently as a sector head for Highside Capital. He has worked on the sell side (with independent research boutiques Sturza�s Medical Research and Avalon Research) and the buyside (at Kilkenny Capital prior to Highside). Sadeghi-Nejad is a graduate of Columbia University and lives in New York. You can follow him on Twitter @natesadeghi.